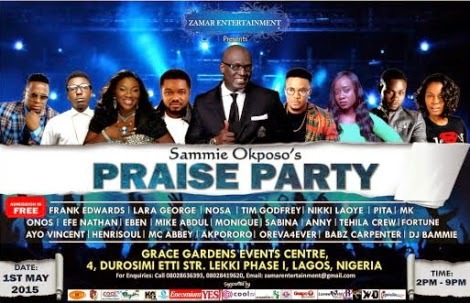 Join Sammie Okposo, Frank Edwards, PITA, Tim Godfrey, Onos, Efe Nathan, Eben, Nosa, Mike Abdul, Monique, Lara George, Nikki Laoye, Anny, Sabina, Tehila Crew, Ayo Vincent, MK, Henrisoul, MC Abbey, Akpororo, Oreva4ever and lots more at the Sammie Okposo’s Praise Party. Details Below. 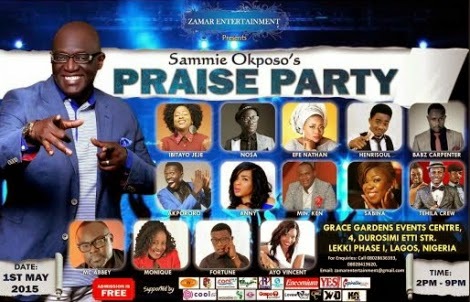 Venue: Grace Gardens Events Centre, Plot 4, Duro Simi Etti, Lekki Phase 1, Lagos, Nigeria.